Libra is my Sun sign. My Moon is in Capricorn and my Rising Sign is Leo. Basically, this means I’m a paradox – shy and introverted, but determined and stubborn, all the while seeking balance and calmness in my life. But aren’t we all a paradox of conflicting emotions and energies? I think so. 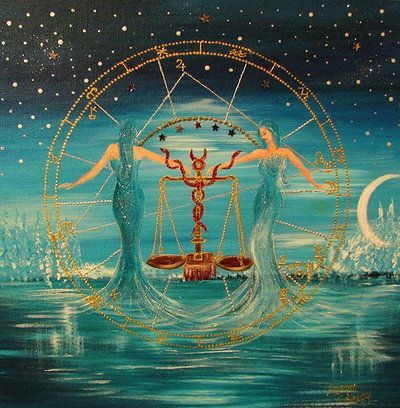 I am so grateful to have been born in Libra. October is my favorite time of the year. I love the crisp weather, and the amazing electric blue sky when the southern humidity has died away. I love the ocean that is still warm enough for swimming, and the chill of the salt air. I love fall foods – oysters and hush puppies and hot coffee. I love the first fire of the season in my wood stove, with me curled up in front of the stove with a cup of tea and a good book. The October full moon – the Hunter’s Moon – takes my breath away in her almost crimson fullness. I love the preparation for Halloween – or Samhain as it is properly called. I love the anticipation of ghost stories, and visits from my loved ones across the veil. I love the periods of quiet reflection I experience during my birth month, and I think the season enhances my need for that reflection. Birthdays always make me think about where, and who, I’ve been, and where I’m going in my life. This harvest time of the year reminds me to be so grateful for all that I have – and I don’t mean “things.” I mean family and friends and health and a sense of place in the world. Reading my Tarot cards, doing my numerology and astrology charts for the upcoming year are a part of my annual birthday ritual. So is writing a major gratitude list. And this Libra season also is a time to prepare for the winter ahead. I have wood in the woodshed, food in the pantry. Years ago, a beautiful friend now crossed over wrote a poem that ended: “And learn to winter-appreciate before winter comes.” And that’s what my Libra soul gives me. Hi Deb, Having grown up in Southern California, we never really experienced the change of seasons the way other areas of the world do. I had moved to the Midwest for about 11 years and then returned to the LA area. I was quite surprised by how the lack of the changes effected me. I had grown accustom to living my life around the cycle of the seasons. I am back in the Midwest and enjoying my cyclical living once again. I even enjoy the winter in so many ways that the people who have lived here their whole lives don’t understand. You mentioned a line in a poem that your friend wrote. Would you be able to share the entire poem with us? The one line you shared is so lovely and I am curious to read the whole poem. LOVELY post! My mom was a Libra too….September 25. Thank you Jemila! It was wonderful to see you, and I haven’t forgotten the follow up on our conversation I need to do. Love to you!